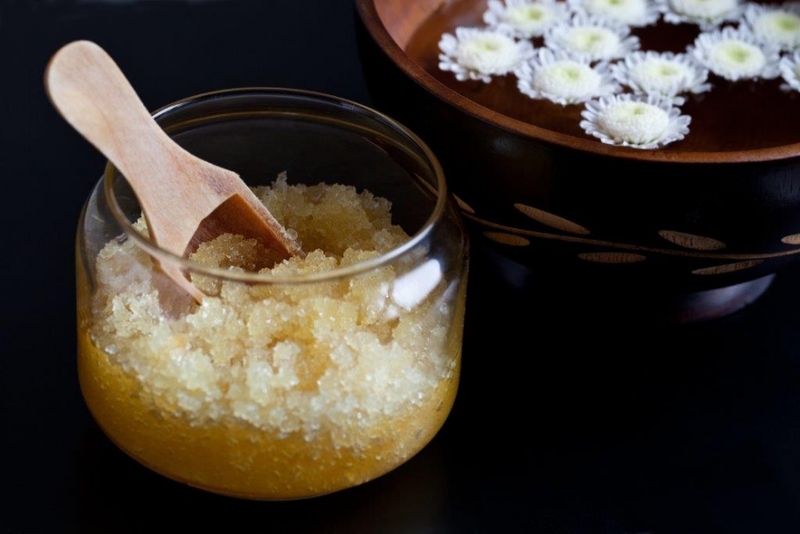 Spring cleaning your skin - Aromatherapy Salt Scrubs to make your skin glow! Part 2 - Amphora Aromatics Ltd – Supplier of pure essential oils and aromatherapy Products. You can get creative by adding dried herbs and flowers as well for added texture. I added some dried lavender which worked wonderfully and it added some extra aroma too. Lemon oil is a natural astringent and is host to an abundance of detoxifying properties. It will help brighten any dull patches on the skin and leave you with a subtle, all round glow. Its natural cleansing properties will also leave you feeling refreshed, revived and ready to take on the day! The Lavender essential oil in this salt scrub helps to balance out the sweetness and sharpness of the Citrus aroma and offers its renowned relaxing and restoring properties. Its stress releasing properties will help you to unwind and release feelings of tension. • 4 tablespoons of carrier oil. • Optional: Fresh lemon juice from half a lemon and peel grated for that extra zing! Simply combine the ingredients in a mixing bowl (best to add the carrier oil, lemon juice and salts first then add the drops of essential oil). Give it a good stir then carefully spoon it into your storage container. The Wonders of Epsom salts! This series of blogs on salt scrub recipes will see a heavy use of Epsom salts; I just wanted to run by some of the great benefits of this amazing ingredient. Epsom salts are in my opinions a natural skincare ingredient that every bathroom should have! Epsom salts are a natural mineral composed of magnesium sulphide. They work wonders used as an exfoliating scrub in the shower and they can also be added to a bath for a nice relaxing soak (they are renowned for helping you get a good night’s sleep). The magnesium is absorbed through the skin, helping the body to regulate muscle and nerve function, stimulate enzymes and reduce inflammation. They are an excellent for those who are very active due to its ability to ease muscle strains and aching limbs. So there you go - another oh so simple yet naturally effective salt scrub recipe! I hope you enjoy giving it a try as much as I did!